The 6th of June is the national day of Sweden and to celebrate it we would like to share with you the recipe of the national dish of Sweden… the famous Swedish meatballs! Meatballs truly are a classic Swedish dish to serve either as an everyday meal or as a more fancy dinner option. Meatballs are served with different side dishes but the best way (according to Swedes!) is to serve them with mashed potatoes, lingonberry jam, gravy and pickled cucumbers. Meatballs were introduced in Sweden in the 1700s but became worldwide famous as a Swedish favorite through the Swedish furniture company IKEA. This recipe was created by the newly appointed IngredientMatcher’s Country Chef for Sweden: ReceptSkaparna. 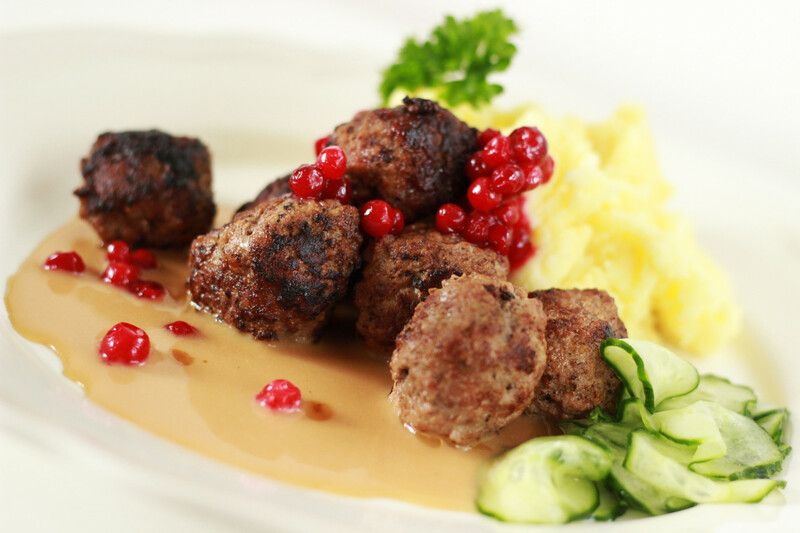 The Swedish national dish consists of mashed potatoes, spicy meatballs, a creamy gravy and sourly taste from the cucumber and lingonberries. A perfect combination of flavors which is hard to resist to! Mix the minced meat with salt, nutmeg, allspice and black pepper until it’s evenly spread. Add the egg and mix until the minced meat becomes solid again. Stir in the bread crumbs mixture and onion. Pour cold water on your hands to form small fine meatballs. Fry a few at a time in a frying pan with butter. The difficult part is to keep the round shape and at the same time get a good sear around. Peel and wash the potatoes. Cut them in 1½ cm slices. Boil them in salted water until they are soft, about 15 minutes. Drain. Mash the potatoes using a potato press or a hand mixer in the pot. Add milk, cream and butter. Season with salt and white pepper. Stir the mashed potatoes until it’s fluffy. Melt the butter in a saucepan. Stir in the flour. Crumble the meat broth and add it to the saucepan. Add water. Let the sauce boil for 3-5 minutes, stirring occasionally. Add the cream and season with salt, pepper and soy sauce. Slice cucumber thinly and squeeze out the water. Place in a bowl. Pour over the vinegar, sugar, salt and water. Mix and let soak for about 10 minutes. About the country chef: Frida Olsson and Lina Sandén run ReceptSkaparna. They create recipes for companies in the food industry in Sweden. They also work as consultants and manage all parts from preparation of recipes, testing (and tasting), styling, photographing and editing. Together, they possess a broad knowledge of meal structure, food culture and culinary recipes.